I think it is worth visiting the regular Keller survey. This one is done in general each trimester and looks at general trends more than actual local voting. You can find it here (PDF) or satisfy yourself with the slides that I picked up below as particularly relevant for the November election. 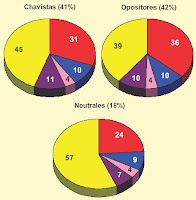 In general the survey notes a decrease of chavismo and of Chavez himself though he still remains solidly close to 50%. But that decrease is not necessarily to the advantage of the opposition: the group with the largest increase are those who are described as NiNi, but who I qualify more as a "I do not care who's in charge, as long goodies keep coming". Chavez has had a long spell on these folks but their attachment to him was always relative and since the great populist measures of 2003-2004, Chavez finds it more and more difficult to hold their attention. All in all the survey confirms my own suspicions: even though it seems that the opposition is gaining the upper hand the election is still very volatile and will be decided in the two weeks before voting, often regardless what polls say today. What I mean is that the opposition seems primed to get at least 6 states but it could go now as high as a dozen. The exact number varies wildly every week depending what Chavez insults were uttered and whether they reached his base and what electrical power outage happened or what shelf suddenly emptied the week end before the vote. Now, let's look at Keller highlights. The first slide that caught my attention is the territorial division he chose. 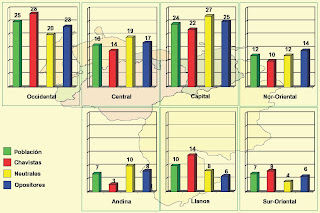 In each region he puts first in green the percentage of voters in that region. And then he puts the percentage of what groups represent in this region. That is why the count is not round. For example, the "andina" region counts 7% of Venezuelan voters. 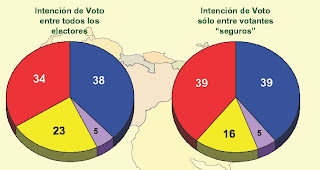 It also includes 3% of the chavista voters of the country, 10% of the NiNi and 8% of the opposition share of the vote. The results are nothing readers of this blog did not know from my previous electoral posts. However there is a novelty for me: Keller gives now the North-Eastern region to the opposition, something that I was giving to Chavez until now. I suppose that it means that Tarek rule has been bad enough that the main state, Anzoategui, is about to return to an opposition administration. Another interesting slide was the one on crime. There all agree, from chavistas to opposition: the governmental action against crime is very deficient. No wonder the opposition politicians are using that argument more and more. The purple slices say it all. A cute slide is whom in the US is the choice of Venezuelans. There we see again a strange concordance. Even though the majority of each group does not know, in each group Obama wins among those who know enough to make a choice (red slices) and McCain loses (blue slices). 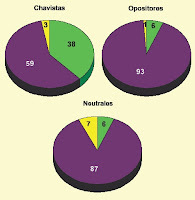 Amazingly inside the opposition Obama scores an even larger margin, 36 to 10 as 31 to 10 for chavistas!!! I suppose that at some level chavismo know that to maintain a screaming Chavez, McCain would be better at the White House! To close this post let's discuss the abstention problem. According to Keller the abstention problem is not really an opposition problem anymore, but it is becoming a chavista problem. That is, the desertion that chavismo experienced in 2007 is confirmed. Many disgruntled chavistas want to punish Chavez for failed promises and authoritarian abuse but they are not ready to vote for the opposition. In the slide below we can see the voting intention, which favors apparently the opposition38 to 34. But when the question is asked to those who are certain to vote, the opposition advantage goes to zero. Clearly chavismo need to mobilize its base and the recent aggressiveness of Chavez might be explained by such results which I am sure are also reflected in the polling agencies hired by chavismo. All of these strange things were observed by Keller in August-September. It is safe to say that these ones are exacerbated in unpredictable ways this late October. We shall see.